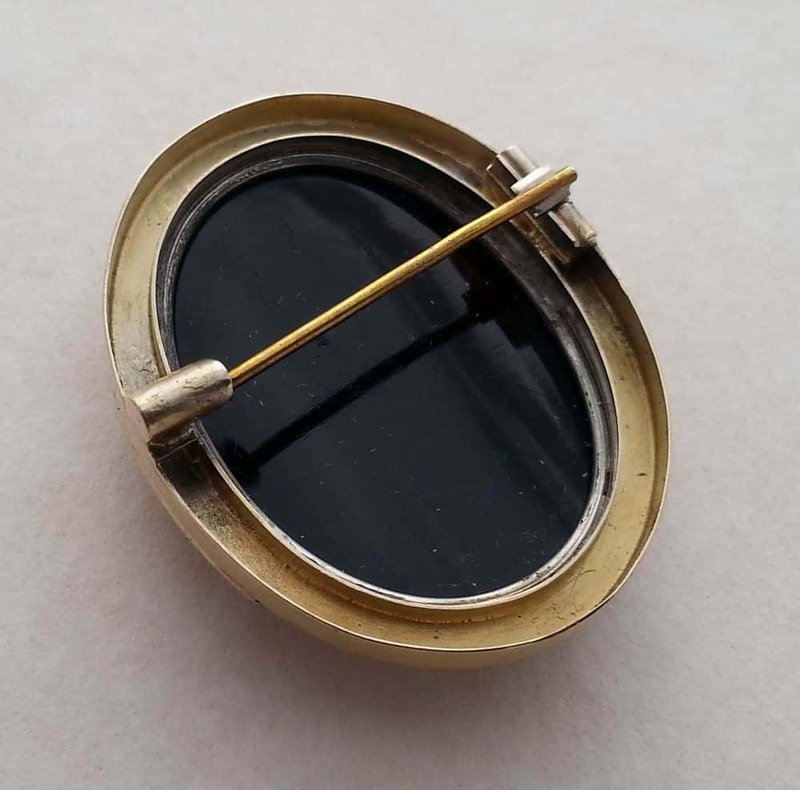 A FINELY MADE, MID TO LATE, 19TH CENTURY GOLD AND CAMEO PIN. 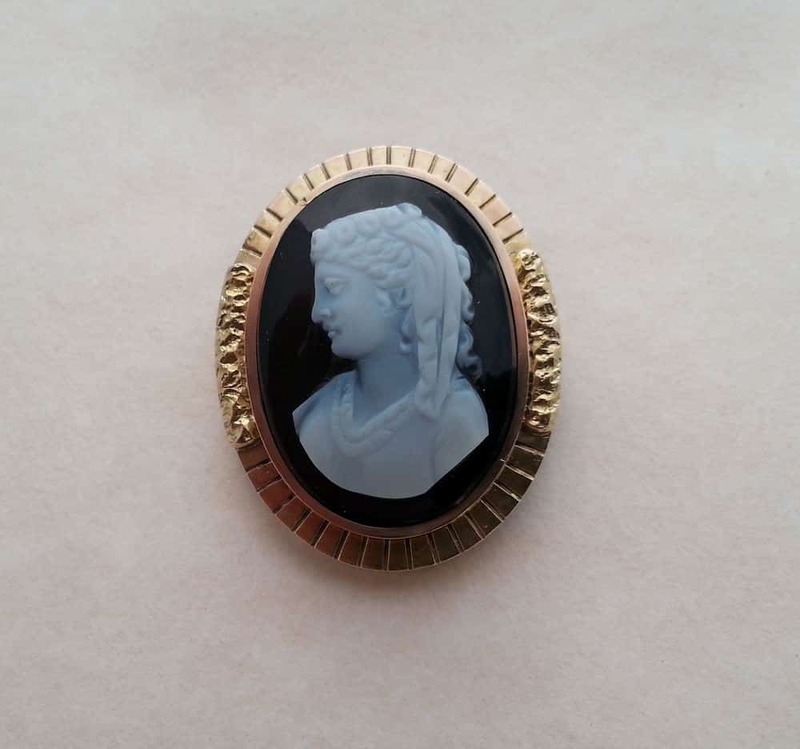 THIS CAMEO PIN WEIGHS APPROXIMATELY 12.13 GRAMS AND MEASURES APPROXIMATELY 36.25MM TALL BY 28.75MM WIDE. 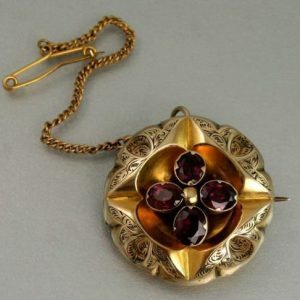 THE CAMEO SET IN THE PIN MEASURES APPROXIMATELY 29MM BY 20.9MM. 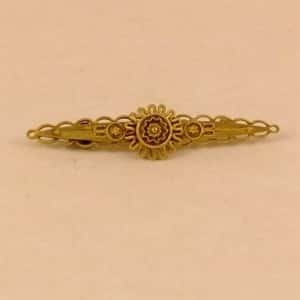 THE BODY OF THE PIN IS NOT MARKED BUT IS HANDMADE OF SOLID YELLOW GOLD WITH REMNANTS OF ITS “BLOOMED” SURFACE STILL EVIDENT. 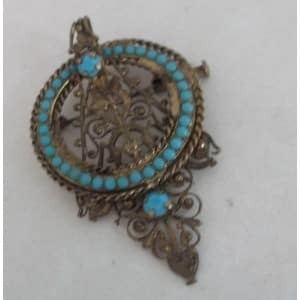 THE DESIGN OF THE PIN INCORPORATES ENGRAVED “RAYS” AND RETICULATED FALSE NUGGET LIKE FORMS FRAMING THE CAMEO. THE SETTING TESTS AS BETTER THAN 14K BUT LESS THAN 18K IN FINENESS. ONE OF THE STANDARD FINENESSES USED IN THE LATE 19TH CENTURY. 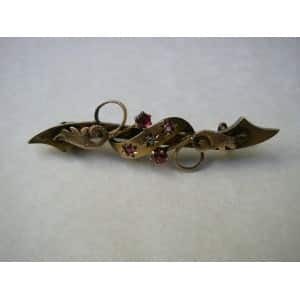 THE HINGED STRAIGHT ATTACHMENT PIN ON THE BACK, THAT ATTACHES THE PIN TO ONES BLOUSE, IS HOWEVER BASE METAL, A COMMON PRACTICE DUE TO THE WEAR AND DAMAGE IT TAKES. THE CAMEO ITSELF IS VERY COMPETENTLY ENGRAVED AND IN WONDERFUL CONDITION FOR ITS AGE. THE PORTRAIT HAS THE LOOK OF THAT OF A LATE CLASSICAL OR POSSIBLY MEDIEVAL LADY OF STATUS OR POSSIBLY YOUNG LADY IN TRADITIONAL ETHNIC CEREMONIAL DRESS. THIS PORTRAIT ALSO BEARS A STRONG RESMBLANCE TO AN ROMAN ARCHIC STYLE STATUE OF THE GODDESS DIANA WITH A FLORAL CROWN, FOUND DURING THE EXCAVATIONS AT POMPEII.